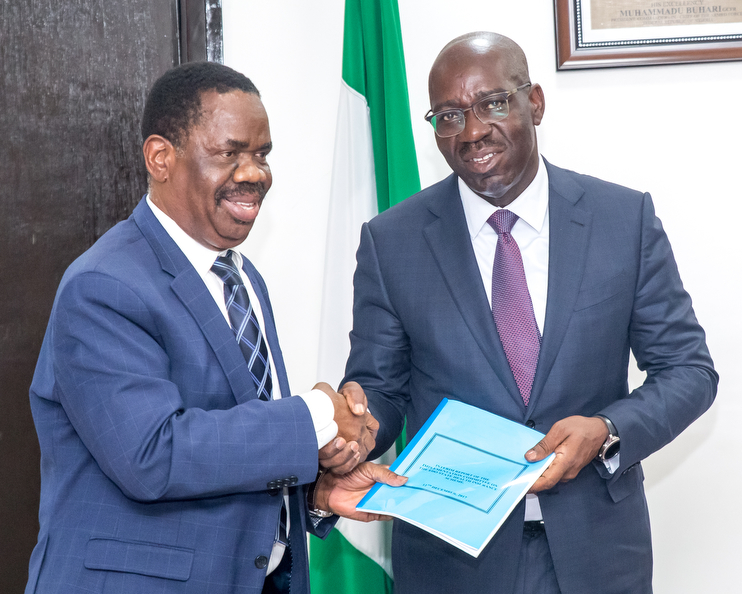 The committee set up to design a framework for the establishment of the Edo State Health Insurance Scheme has submitted its report to the Edo State Governor, Mr. Godwin Obaseki. Receiving the Report at Government House in Benin City, Obaseki expressed gratitude to members of the committee for drafting a bill for the establishment of the health insurance scheme and assured them that it would be sent to the Edo State House of Assembly for consideration. He explained that his administration was committed to ensuring that the health sector is repositioned to guarantee sustainable funding of health care services. “We want to ensure that people who require health care services can afford and access them. The credibility of the system is also very important, to enable the health insurance scheme function well,” he said. The chairman of the committee, Professor Mustapha Danasi, said the committee’s draft bill would provide insight into the operations of the scheme for members of the Edo State House of Assembly. Danasi recommended that the governor approve a stakeholder engagement session that will sell the health insurance scheme to Edo people. The committee was set up in July, to design the framework for the implementation of a state-wide health insurance scheme for all segments of the society.